Your senior dog is past the days of jumping off docks and climbing up mountains, but that doesn’t mean their quality of life should be diminished. The key to keeping your senior dog mentally healthy and happy is getting them involved in something other than snoozing on the couch. Nose work is a canine sport that takes after training methods used for professional scent detection dogs. Every dog with a sense of smell has potential to join in and succeed. It keeps their brains working and their bodies moving, and it’s especially beneficial for senior dogs. Nose work is all about encouraging a dog to embrace their natural instincts to hunt and sniff. We already know a dog’s sense of smell is incredibly powerful. They use their noses to learn about the world and identify people, objects, and places. 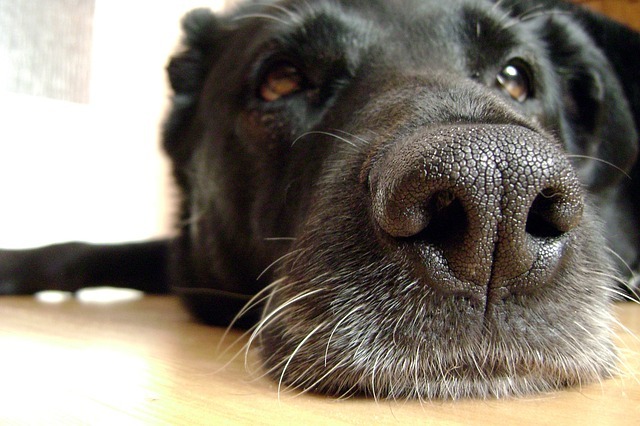 Nose work is designed as a low impact activity based on a behavior dogs do all on their own. It channels their sniffer instinct into an exercise that benefits both mind and body. The goal of nose work is for dogs to use their noses to search for and find specific scents in a staged or natural environment. The three official scents are birch, clove, and anise, with birch being the beginner and introductory scent. In official competitions, there are four levels of locations used for searching: interiors, exteriors, containers, and vehicles. It’s the dog’s job to search the designated areas and use their nose to find the specific scent. Once they find it, they alert their handler and rejoice in whatever reward motivates them best. All dogs instinctively know how to sniff things out, and that makes training for nose work relatively simple. There are several methods for teaching a dog the basics, but they all start by initiating a positive association with the scent. When your dog gets a whiff of the target scent, you want them to feel motivated and excited. You do this by reinforcing their desire to hunt and pairing the scent with positive reinforcement—like a high-value treat or favorite toy. Once they make the connection between the scent and the reward, they’ll be determined to do what it takes to earn their prize. Most people start nose work training by holding a scent canister in one hand and rewarding the dog every time they take a sniff. As the dog progresses, the canister gradually gets farther away and is placed in increasingly difficult hiding places. With practice, you’ll be able to use multiple scents in unfamiliar environments, and your dog will know to sniff them out. During competitions, dogs are judged based on time and accuracy. But if you’re looking for a way to get your senior dog up and active, you can do scent work in the comfort of your living room. There are several books, videos, and websites dedicated to teaching dog owners how to make it happen. The great thing about nose work is that nearly every dog can do it. There are breeds specifically known for their sniffing abilities, like Bloodhounds, Beagles, and Labs, but every dog, regardless of breed, knows how to use their nose. Dogs recovering from injuries, dogs in wheelchairs, blind or deaf dogs, hyperactive dogs, and senior dogs all have the same opportunities to become nose work champs. Slowing down is a part of the aging process, and it’s easy to think your senior dog doesn’t need as much mental and physical stimulation as they did when they were younger. They’re more likely to sleep all day than chew up your couch cushions, but that doesn’t mean stimulation stops being important. Cognitive decline is a serious risk for seniors. Side effects of aging often include altered behaviors like increased anxiety and noticeable irritability. Growing older can also cause confusion, unprecedented aggression, and depression. The best way to stave off these mental effects of aging is to keep your dog’s brain primed and ready to work. Using their mind on a regular basis helps keep their brain healthy. Nose work is a great way to mentally and physically stimulate a senior dog. Sniffing out a scent for the purpose of earning a reward keeps their mind active and focused. The gears in their brain constantly turn as they concentrate on the task at hand. It’s exercise for their brain, and at the same time, they also exercise their bodies. Senior dogs can’t do a lot of the physical activities they used to, but nose work gets them off the couch without the risk of overexertion. You don’t need to get involved in official competitions to help your senior dog reap the benefits of nose work. All you need is something for them to smell and somewhere for them to search. If you don’t want to use the traditional nose work competition scents, there are other ways to use scent work to your dog’s advantage. A snuffle mat is a tool often used for beginner nose work. 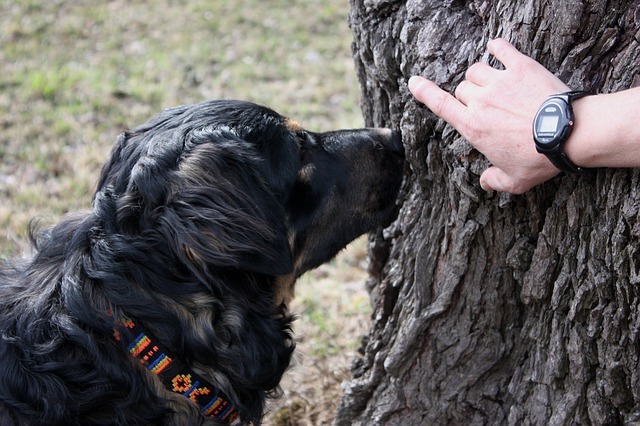 It brings out a dog’s natural foraging instinct as they sniff their way to finding hidden treats. The Sniff Diggy™ Nose Work Mats from iHeartDogs feature strips of fabric that mimic long grass in between which you can hide treats. Dogs love using their noses to find covered up treasure, and they don’t even realize they’re exercising their brains. Your dog’s mental health is just as important as their physical health. Senior dogs need enrichment in their lives, and it’s your job to provide it for them. Nose work is something you can do together that will strengthen your bond and keep your dog mentally sharp and youthful.